QQ Cuisine – she eats. We arrived at Fu Fu Cafe last night only to find several confused Chinese people standing around the front door, glaring at a piece of paper that had been nonchalantly posted inside the glass: Closed for summer holiday. Be back July 24th. No other fanfare, just a simple notice to go get your dumplings elsewhere. 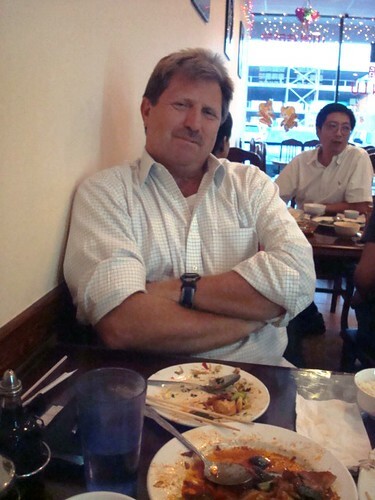 Momentarily nonplussed, I tried to think of what other places were around but then remembered….we’re in Chinatown. There’s a restaurant every three feet. Why not just try the place next door? It was packed, after all, always a good sign in my book. We walked into Fu Fu’s neighbor, QQ Cuisine (which is also called “Chinese Cuisine” out front, although I think that’s more of a description of their food than an alternate name). There was one lonely table towards the back with only three chairs, but it was perfect for the three of us. It took a while before we were noticed and our drink orders taken, presumably because the place was bursting at the seams with hungry families ordering obscene amounts of food. Our waitress was nearly the farthest thing from friendly I’ve ever encountered. I only say “nearly” because the evil waitress at Chinese Kitchen who refused to bring us drinks or chopsticks could definitely beat her in a cage match. We pored over QQ’s enormous menu, which was full of tantalizing-sounding entrees such as Special Jellylike Mass, Fried Fluffy Dough Sticks, Quick Fried Lamp, Assorted Beancurd, Pork Bibs, and Lion Head in Casserole. I was unsuccessful in convincing either of my dining companions to try one of these items. We settled on Pork Bun with Juice and Green Onion Pancakes for appetizers and placed our order. I was informed by the waitress that they weren’t offering the Pork Buns tonight and she recommended the Pan Fried Bun instead. Sure, why not! We placed our dinner orders at the same time, as we gathered (quite correctly, it turned out) that it was going to be very hard to catch her attention later on. I went for the Twice-Cooked Pork, Richard for the Sauteed Chicken with Broccoli and my father for the Beef with Chinese Broccoli and Fried Flat Rice Noodle, which sounded to be very similar to my favorite Vietnamese dish, Pad See Ew. The waitress came back nearly 30 minutes later, during which time we sat hungrily and watched other diners with envy, to inform us in spotty English that the kitchen was out of Chinese broccoli. She suggested my father try the Beef with Fried Flat Rice Noodle, which is essentially the same thing but without the broccoli. She even made the bold statement that it’s one of their best dishes (out of 162 items on the menu, not counting lunch dishes, I guess that’s saying a lot). We waited for what seemed to be an interminable amount of time (in reality, it was another 20 minutes). All around us, huge families had steaming plates of fried tofu, hot pots, duck and all other manner of tempting plates delivered to them and happily chattered away in Mandarin while they ate. Then, out of nowhere, a platter of Twice-Cooked Pork finally clattered onto our table. No other entrees or appetizers came with it, but we were starving so we dug in. It was so worth the wait. The soft, savory strips of pork were glistening with spicy Szechuan sauce and were accompanied by fat bulbs of green onions. Eaten with the sweet sticky rice that was delivered along with it, this was a meal made in heaven. We made quick work of the Twice-Cooked Pork just in time for the rest of the food to arrive at our table. We received the rest of our entrees and our appetizers all at the same time. The table was soon groaning under the weight of all the food, rice and tea. We no longer envied the other diners as we tore into the food with a frenzy befitting a pack of wild jackals. 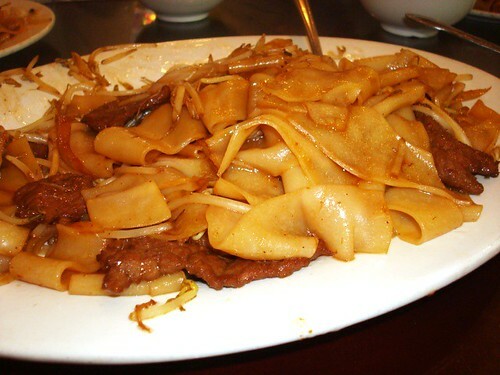 As the waitress had promised, the Beef with Fried Flat Rice Noodles was indeed delicious. The noodles were enormous things, wide and wonderful. The beef in the dish was more of an afterthought; it was all about the noodles and their sweet, smoky sauce. A liberal sprinkling of bean sprouts throughout gave it a crisp, refreshing crunch which tempered the heaviness of the noodles. The Pan Fried Dumplings were a nice surprise, too. The dough was thick and soft, with a lovely brown crispness on the bottom from the pan-frying technique. Eating them was like opening a present: the pork inside was better than any I’ve tasted in a dumpling so far and I was utterly taken aback. I still wished for that warm gush of soup when I bit into the dumplings, but I couldn’t find any fault at all with their tender skins and delicious pork. The Green Onion Pancakes were less than stellar, with ingredients that immediately spilled out as soon as you took one bite. If only the tiny ingredients (chopped scallions, chopped noodles and chopped fried egg) had stayed put instead of scattering to the wind, I would have enjoyed it more. Richard’s Sauteed Chicken with Broccoli was good, but nothing magical. The broccoli itself was, however, nice and fresh. In all, we’d managed to get enough food to feed a village and had enough left over to fill at least two takeaway boxes, which we did posthaste (Chinese for lunch today!). That’s right: $32. God, I love Chinatown. Where else can you eat so much high-quality food and get such a diverse cultural experience for this kind of money? 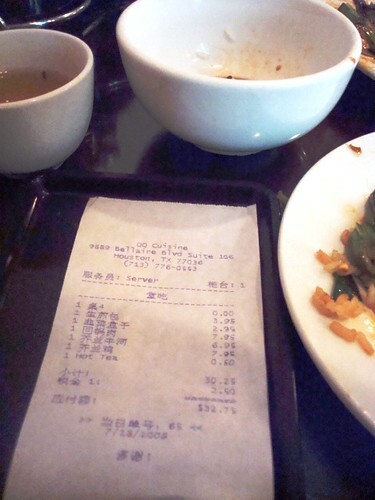 In the end, I would definitely recommend QQ Cuisine for the quality of its food. I wouldn’t recommend going and expecting to be doted on, service-wise, or expecting your food to come out quickly. If you don’t think you can last through a 30 to 45 minute wait for your entrees or appetizers, then just grab a pre-made appetizer from the refrigerator at the back of the restaurant (or a can of Busch beer, which everyone else was drinking for some godforsaken reason) to nosh on while you wait, and just soak up the atmosphere. poor QQ always gets overshadowed by FuFu Cafe next door sadly- they are a very good casual Chinese restaurant in their own right! the menu’s are actually slightly similar – i really love their appetizers – good variety of little Chinese dishes- glad you got to go! I’ll take an order of Lion Head Casserole with a side of Jellylike Mass, please. And to start, some Fluffy Fried Dough Sticks. Mmmmm. Fried Dough. 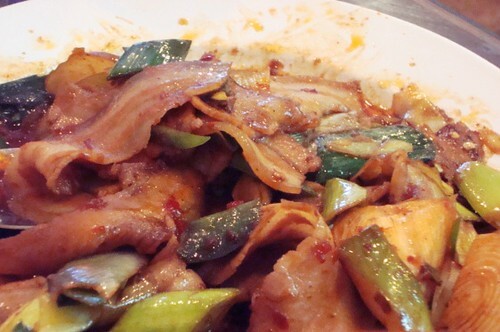 From the photo, that twice-cooked pork looks like pork ear. When I go, I’m getting that Assorted Beancurd. Nothing is better than a huge assortment of beancurd. It sounds like QQ needs to hire a new menu translator. My bacon radar went off……was that seriously bacon? 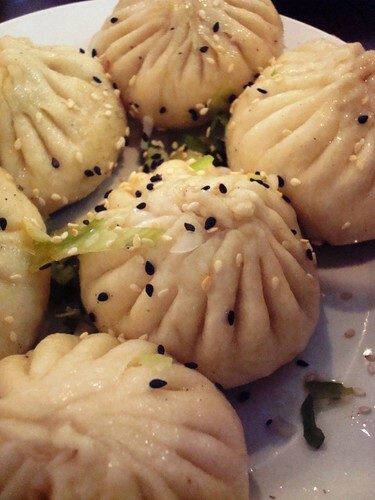 Those dumplings looked divine – mmmm the subtle and scrumptious sesame seed. I hope everyone who goes to FuFu will give QQ a try as well. I personally think QQ has much better food quality and taste then FuFu. After looking at a handful of the blog articles on your web page, I truly appreciate your way of writing a blog.